I tried Medium, I even had a paid account, but I stopped using the platform in part because the content it was suggesting was so tailored to me that it created a worse filter bubble then any other platform I'd used, and in part because I tired of forcing people to submit themselves to more tracking and profiling. If you go to a Medium article, you need to log in, and like most sites, the easy path is to give Google and Facebook even more data by logging in with those accounts. I generally avoid going to the site at all these days, using Pocket's vastly superior content ecosystem for content discovery and reading. However, the irony of today's "clicked through to a link on Medium" experience must be shared. 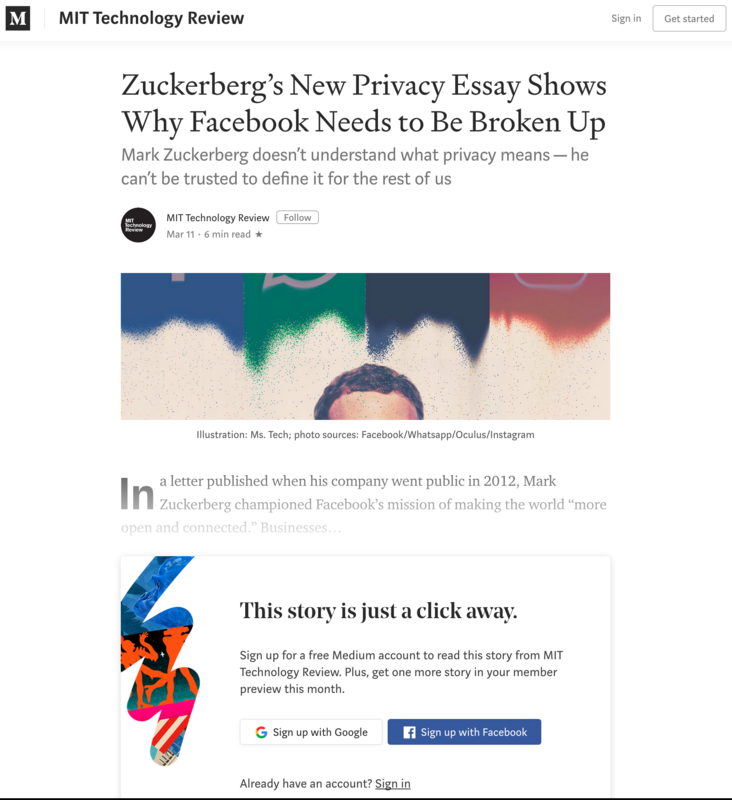 I was intrigued by an MIT Tech Review article titled "Zuckerberg’s New Privacy Essay Shows Why Facebook Needs to Be Broken Up (Mark Zuckerberg doesn’t understand what privacy means — he can’t be trusted to define it for the rest of us)" and was greeted by this. Like MIT Tech Review, so many companies are abdicating control of their content to a for-profit site that monetizes (and profiles) their users, and encourages them to feed even more information about themselves into the information economy. Please, stop. Host your own content. Own it, control it, get folks to pay for it, or not. If you like the writing experience on Medium, then I suggest trying Ghost, where this site is hosted. I'm really enjoying it, and publishing is just as fast and pleasurable as Medium's editor.